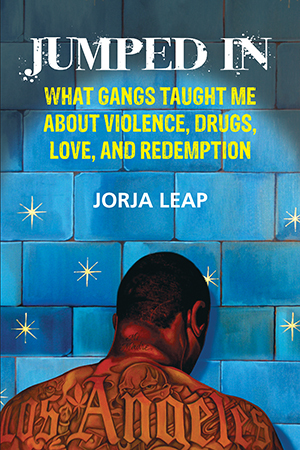 When Jorja Leap began studying Los Angeles gang violence in 2002, she encountered a myriad of proposed solutions to the seemingly intractable “gang problem” and set out to discover what was really going on. In Jumped In she brings us stories that reach behind the statistics and sensational media images to the real lives of those stuck in-and trying to escape-“la vida loca.” With the eye of an anthropologist and a heart full of compassion, Leap immerses herself in the world of the gangs and the people who interact with them on a daily basis-trying to arrest them, control them, and help them. She finds priests and police officers, murderers and drug dealers, victims and grieving mothers, often partnering in unlikely ways. Leap’s work draws upon intimate material, from interviews to eyewitness accounts, telling the deeply personal stories of current and former gang members spanning three generations. And in the midst of her exploration, Leap faces her own dilemmas with a husband in the LAPD and a daughter in adolescence. Ultimately, Jumped In is a chronicle of the unexpected lessons gang members taught her while she was busily studying them. And Bo quietly says, “All they see is prison or death. They need family.